Many of us start a business to escape the grind. But we somehow find ourselves overworked and exhausted. ‘Was it all worth it?’, we ask ourselves? In the E-Myth Revisited Summary, we discuss how business owners commit a fatal flaw. They trap themselves into “job” within their business. Inevitably, even the businesses that make it past the infancy stage crash and burn. Big Idea #1: If you’re relying on expert employees, you’re destined to fail. When you start your business, you’re most likely a one man show. You perform at an extraordinary level. You become an expert. But as the business grows, you hire employees to cover certain roles — and you expect them to be extraordinary as well. This can be disastrous. Far too many variables could go wrong when relying on people to be extraordinary. The only thing predictable about people is that they can be unpredictable. Instead, you should design a reliable system that can make ordinary people perform at an expert level. The goal for every business is to deliver value. The value delivered should be systems-dependent, not expert dependent. In this context, the system becomes the tool that your employees use to deliver the value desired. Big Idea #2 : Knowing how to do the technical work, doesn’t mean you know how to run a business. Many of us start a business because we excel at something we did for some else. For example, a hairstylist will open a hair salon or a software developer will start a software company. This is the fundamental flaw we make. We believe that knowing the technical work, means we know how to run a business. We don’t realize that the technical work and the ‘business’ work are two entirely different things. This inevitably leads us to focus too much on the technical work and ignore the other components of the business. To grow your business, you need to know how to design a system, organize tasks and hire people accordingly. Big Idea #3: Work ON Your business, not IN your business. Most entrepreneurs fall into the trap of turning their business into a job. To escape this trap, ask yourself how your business can function without you. Envision the tasks, systems, and people needed in place for that business to function today. Doing this is you working ON your business. Now hire yourself (temporarily) to work within your business for the various tasks. In this context, you set up your business so you can eventually hire people to fill in the slots your business needs to run independently. 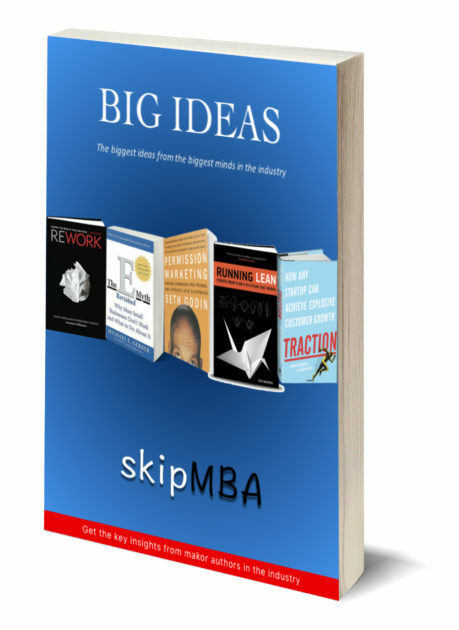 And check out the DIY MBA Reading List for more summaries on books you should read!